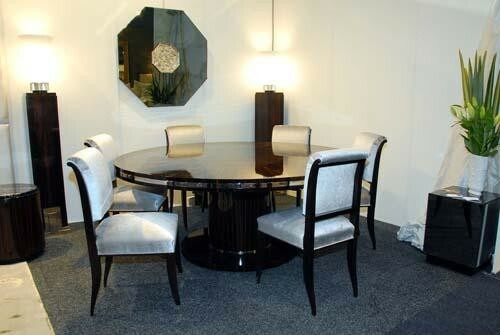 The superb Art Deco dining room furniture is the Alexander table and Ducharne chairs. The table top is a 'sunburst' pattern of Macassar Ebony. The Art Deco chairs are a Ruhlmann design, upholstered in silver velvet and originally designed for the Ducharne Hotel. An Octagonal mirror in grey 'antique' mirror finish is framed in silvered bronze with a centre relief sculptured plate of Madonna and Child. French Art Deco glass urn lamps with silver-leaf bases sit on Macassar Ebony pillars with silvered bronze detail.